It’s baking today; Honey and I are hot and bothered. We set off for Grenofen at about 5.30pm and walk downstream towards Double Waters. We stop at the long, slim pool about half way down. It’s sheltered by beeches and oaks, in a place where the water is forced, tinkling, through a narrow channel. 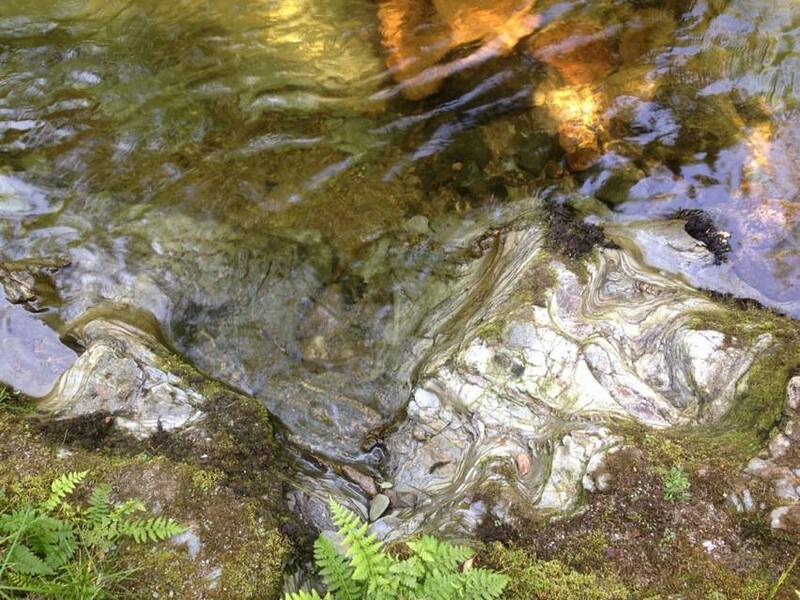 The rocks down which we step echo the course of the river with whorls and curlicues eroded by spates. I float through midges like electrons whizzing around the surface and feel the prickly, sticky sweat wash away. Where the sun dapples through the leaves the riverbed gleams gold and amber and resembles heaped coins to my un-goggled eyes. A dragonfly swoops overhead. 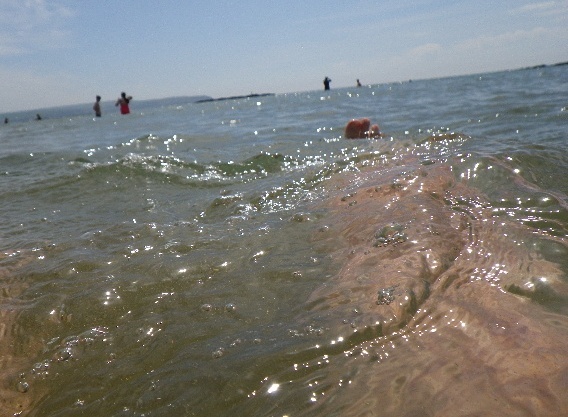 Having been coiled to the point of snapping by a certain tennis match, Honey and I are relieved to be able to cool off and unwind in the sea. It’s heaving on Bovisand despite us not arriving till 7pm, since it’s high tide and everyone’s crammed into the few yards of remaining beach. 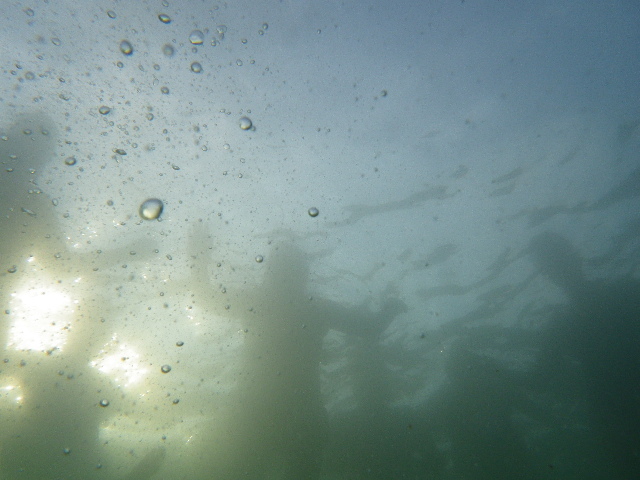 We stride out into water that looks like mercury and wallow out to the buoy before spending some time engaged in underwater antics and buoy-mounting. I swim back in front crawl and my shoulder is, remarkably, still fine. Honey is on the lead as she’s obsessed with balls and intent on crashing every game of cricket or dog-playing session on the beach. As we eat our picnic, she takes off with me attached, causing my plate of pasta salad and lettuce to fly skywards before crashing into the sand. I retrieve Honey from the sea, and tie her lead to her coiled metal spike that’s screwed into the beach. She takes off again, complete with spike, in pursuit of a labrador chasing a stick and once again has to be retrieved from the sea. The spike is lying on a rock, and luckily has failed to impale anyone. 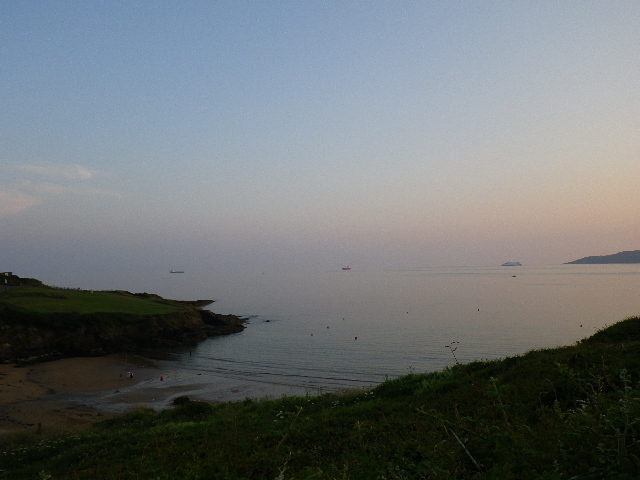 As the sun drops behind the headland the sky melds into the sea in pastel shades of pinky blue so that distant boats appear to float through the sky. I feel I could join them. Well done Andy Murray! 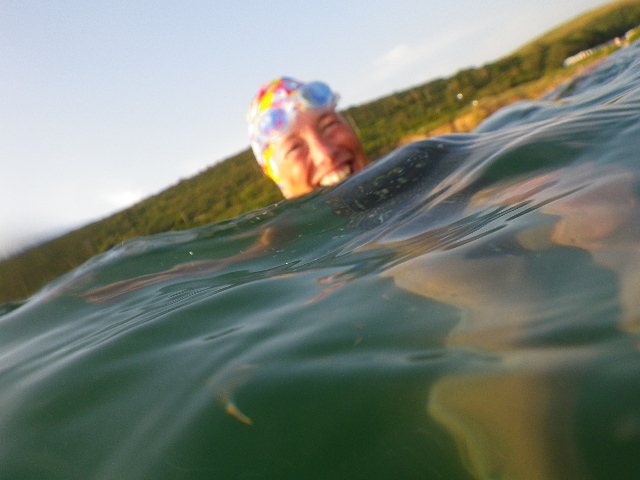 I’ve cancelled today’s swim, which was rather too exciting and not something I felt able to plan and execute just yet. A group of us have met up this evening mostly because we want to see each other and talk and remember JJ in a place where we feel his spirit. The Super Full Moon lends enhanced significance. 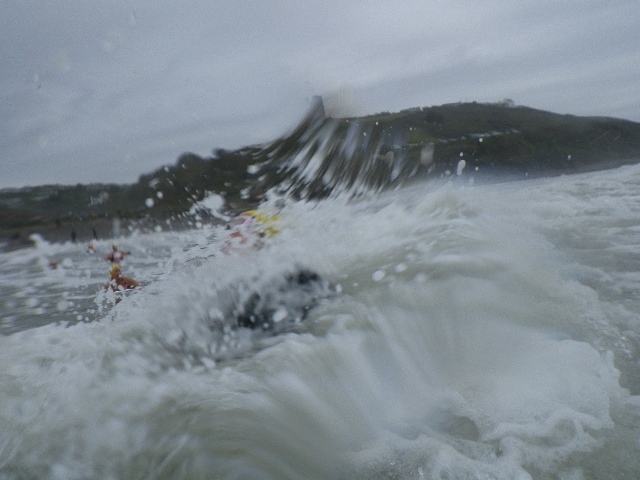 Bugle Hole in early evening on a high spring tide and with a sporting swell is simply awesome. It looks like nothing as you meander down the cliff path, but once you’re in you’re swept along, hugged in the bosom of the sea, pushed and squeezed and pulled and splatted against rocks if you fail to pay attention, as I did. 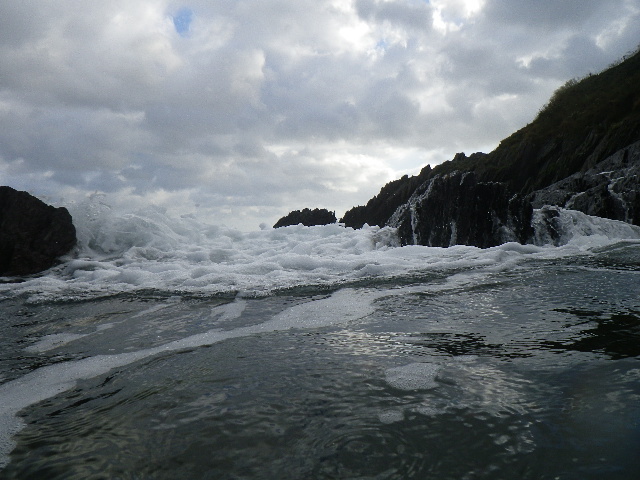 Waves crash and foam, rocks grow taller and shrink like Alice in Wonderland, and the Blow Hole at the end gurgles like a giant with IBS, despite being gob-stoppered by a buoy. Well worth the giant bruises. 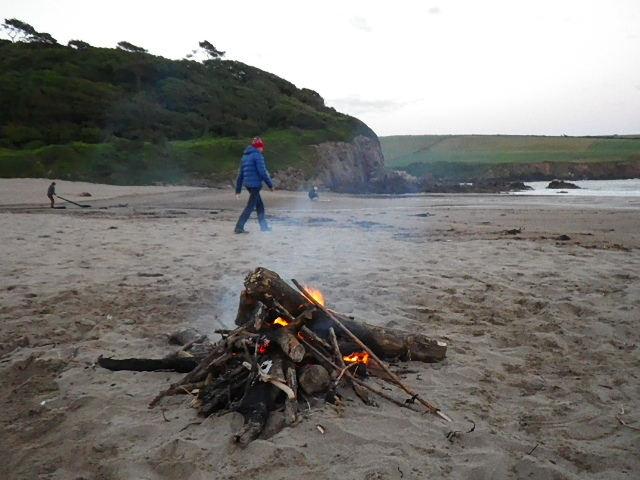 Afterwards, we amble back to Mothecombe and collect driftwood for a fire. Then we lay out our lavish picnic and await the great event; the rising of the Full Super-Moon above the headland. Allan and Kate’s boys do a grand job with the fire, which has been carefully and anally constructed by Rachel, who then assumes responsibility for predicting the appearance of said Super Moon using her Android app. We learn random facts about planets elicited without the aid of specs and including that there’s a planet called ‘Sooth’, which turns out to be ‘South’. Of course JJ would have used a far superior iphone5. 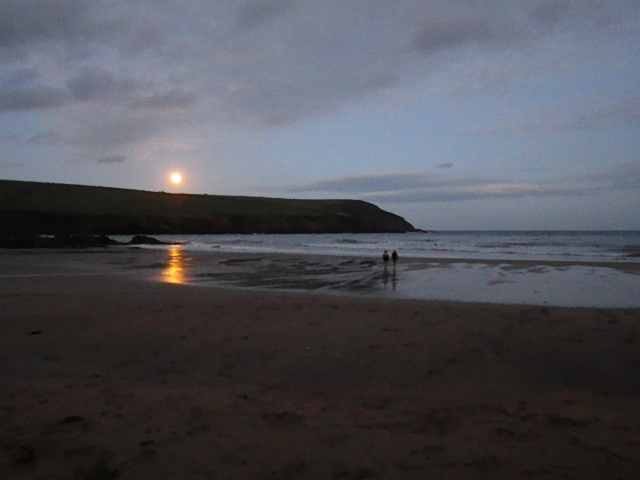 We eat and chat and laugh, and Baa, Lou, Helen, Linda and Michele construct a moon from pebbles and driftwood on the sand as a kind of incantation, while slate clouds mass behind the beach. Suddenly, she’s here. Rising orange and dribbling a wandering reflection across the damp left by the receding tide on the sand, glowing and pregnant with our emotions. We toast our Full Super-Moon and our dear, lost friend JJ with sparkling rosé wine. 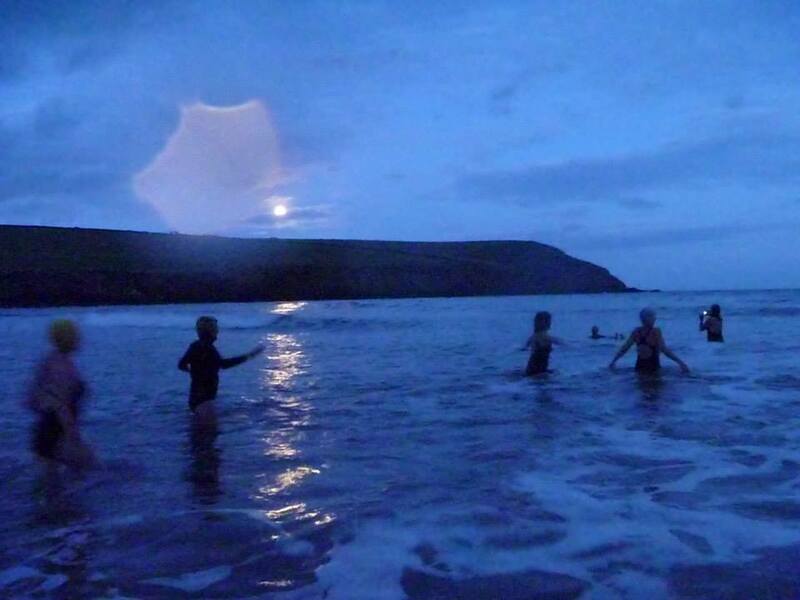 Then we change into wet kit and run into the sea, Michele and Helen do cartwheels and we all body surf and dive and play in the breakers in the moonlight. The black clouds roll over, but JJ’s Moon forces cracks of light, incandescent through the darkness. It seems simple to meet on Bovisand Beach, however there are three beaches and this results in some confusion so that we end up on opposite sides of the cliff. I sit and chat to Susan while the Testosterone Twins swim for miles, having promised to wave to Helen and family should they spot them on the next beach. At this point Helen arrives, panting, on Bovisand Two, which is not Bovisand it’s Crownhill Beach, as she mentions several times. Dan has set up camp on Bovisand beach with Issy and baby Freddie and most of the contents of their house. After twenty minutes of full on nagging, I persuade Helen that the walk there and back to collect everything will do her good, especially since she’s complaining of being unfit. Off we go, leaving Susan and Richard’s family to guard the kit. Helen and I climb the cliff and walk across the grass to Bovisand Beach, from where we can see Dan’s Death-Star sized beach camp on the far side. In fact, you could have seen it from the International Space Station. I’m beginning to wonder whether we can make it back with all their belongings, but after some hours of packing and loading we manage to pick it all up, including both kids, the beach umbrella, pram, tent, bags, food, extra clothes, range cooker and king-sized four-poster bed. We stagger across the beach and up the path, leaving Dan and Freddie with instructions for dumping a few bits in the car (car? Pick up truck more like). 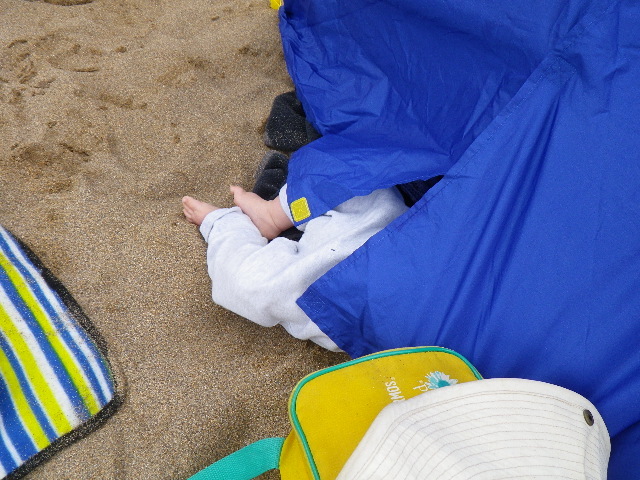 Finally we’re all together on the same beach, the kids are playing and scaling the cliffs, Issy does one-handed cartwheels, and we laugh at Freddie rolling repeatedly out of his tent. 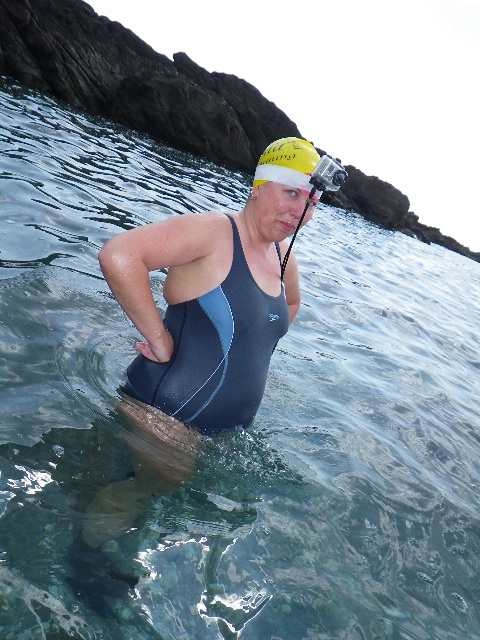 Ruth appears with perfect timing for our swim. The sun has vanished, but we’re confident that the sea will be less cold than the boys are claiming, especially bearing in mind the Dart was more or less warmish yesterday. In we go, and it’s brass monkeys. Neck ache, cheek ache cold. Ten maybe? 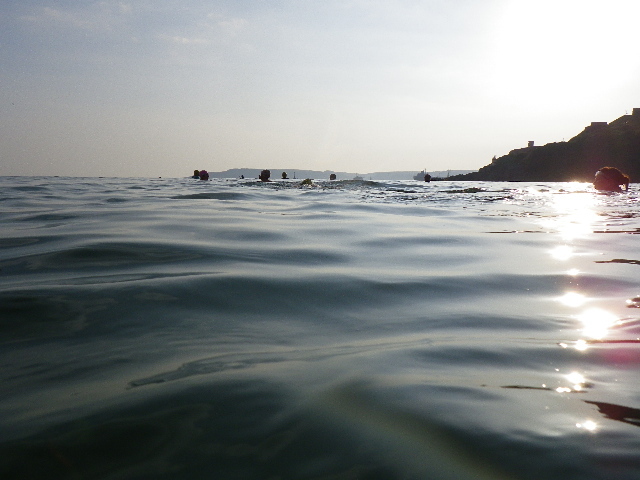 There is smashed weed swirling around in the shallows, and Helen mentions – but only three or four times – that the sea on Bovisand Beach is much nicer. She struggles to keep her body from the water and goes through a series of facial contortions before ending up bobbing around and grinning broadly. We swim out to the buoys in water that’s the colour of a forestry plantation on a dull day, dark green and light-sucking. Over towards Cawsand mist descends and blurs the horizon. The sea magically turns battleship grey. 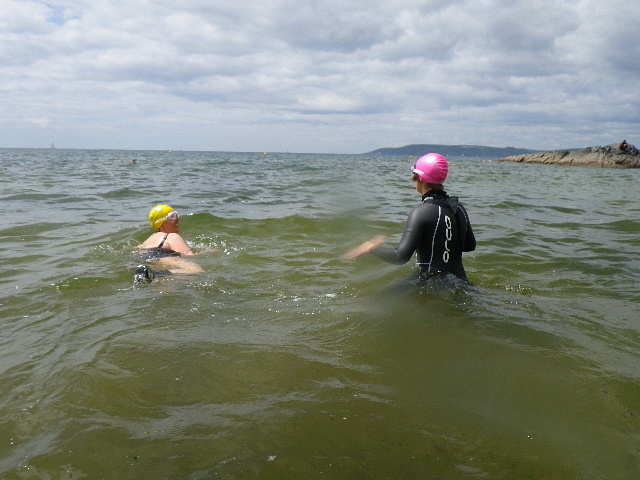 As we swim back in we see Stephanie who leaps into her wetsuit and comes in to join us. I’m too cold now, and get out leaving Ruth and Helen to swim. 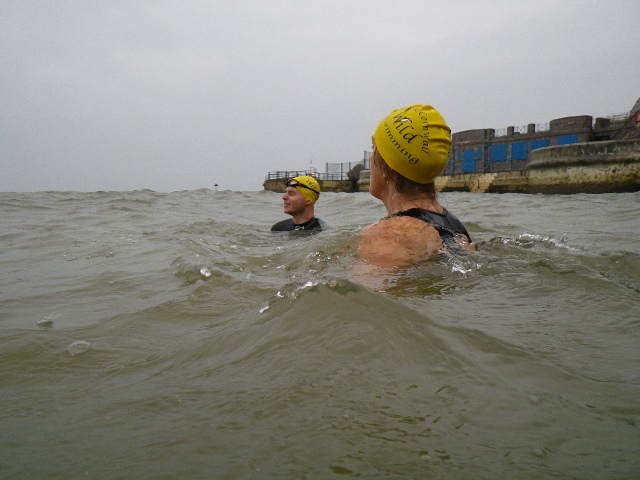 Dan, in training for a Channel relay which has to be done with no wetsuit, gets in after some hectoring persuasion from Helen, and stays in for an impressive amount of time. I’m dry but still really cold in the chilly wind, so I borrow grisling Freddie who acts as a rather cute hot water bottle, and falls asleep on my chest. Helen kindly lends me Dan’s jacket, and lends Ruth Dan’s hoodie. Dan’s cold acclimatisation thus continues on the beach. We eat and chat and shiver on the sand for hours and put the world to rights. Then the sun reappears and it’s suddenly almost tropical. Such a lovely afternoon. Bigbury on Sea, Bank Holiday Monday; blue skies and wisps of cirrus, a bank of fog over the horizon, and the usual cheeky gale. 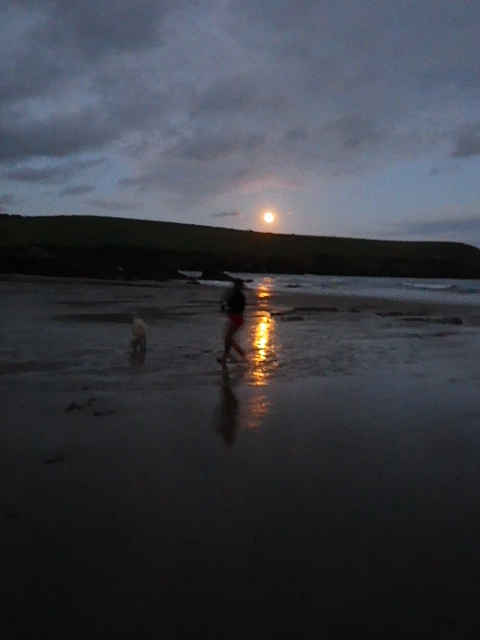 It’s low tide and light glints from the sand beneath the shallows and illuminates the sea so that it glows turquoise. 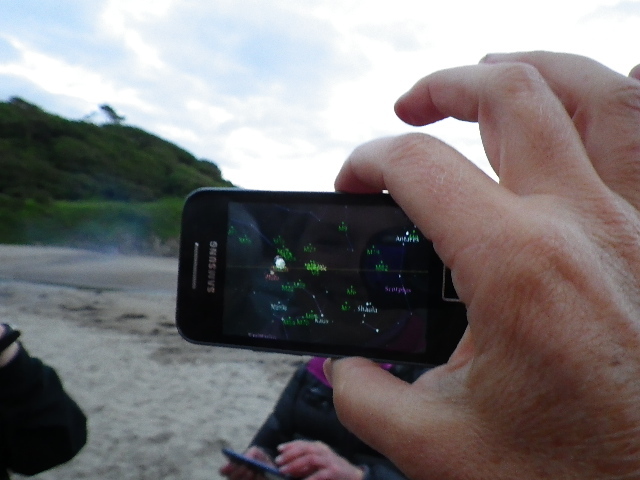 We set up on the sand and chat while a few of our friends swim round Burgh Island, some for the first time. I’m hugely envious, but unable to join in owing to my shoulder injury. We go to meet the first swimmers, but they take off up the stream towards the Lifeguard hut like Triathletes. Then we discover the gang think they might have lost one of our newbies – but the Lifeguards know exactly where he is, and sure enough he appears in the distance having become over-excited and taken the long route round the easterly reef. 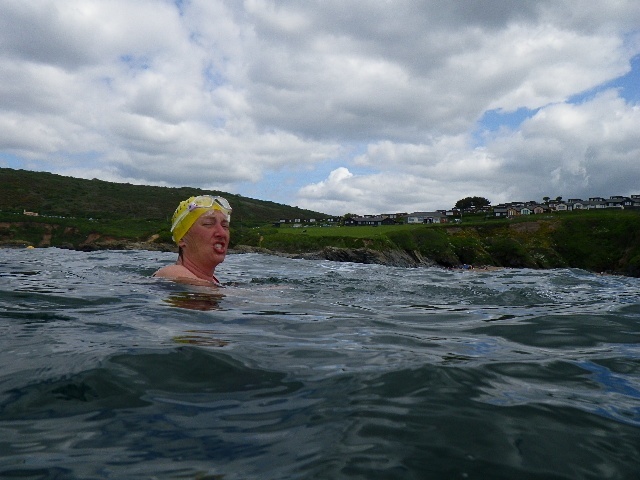 Finally it feels warm enough for a bob – although I’m acclimatised, being unable to swim properly means the cold grips fast. We run in and there is no pain at all for the first time in ages. 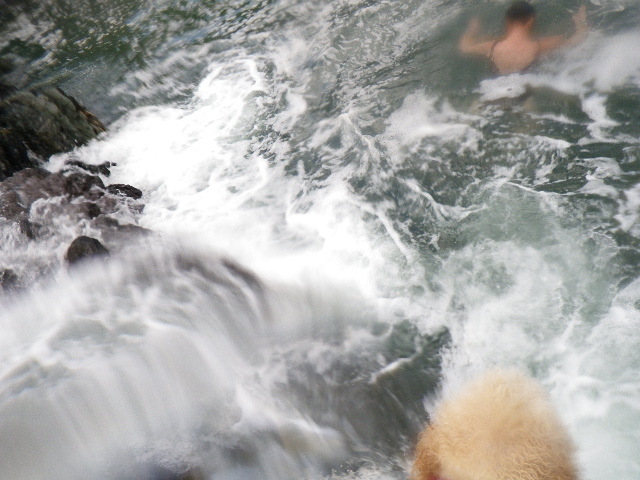 The actual water temperature is around 10-11ºc, practically boiling point by recent standards. I mess around and play with Honey. Tiny waves break and splinter the light around us. It’s like being on a cloud. Afterwards we continue to blether, wrapped in the smoke from barbecues and washed by the hubbub of people at play. Honey and I arrived at Wembury and paid an extortionate £4.50 for the privilege of parking before wandering down to join Teri and Michele de la Mer who were staring intently at what appeared to be a nicely-coiled turd, but which turned out to be an adder; another had just vanished through a hole in the wall. The tardy arrival of spring had brought all of us out to bask in the sun. We set up at the far end of the beach, about a hundred meters from the only other occupants, but were quickly approached by the National Trust man who threw us off for daring to have a dog with us. Apparently there were some children due. I notice he didn’t throw the polluting traffic out of the car park, or close the lane in case any of them were run over, or spray Dettox around the rocks over which the sewage outfall discharges in wet weather. 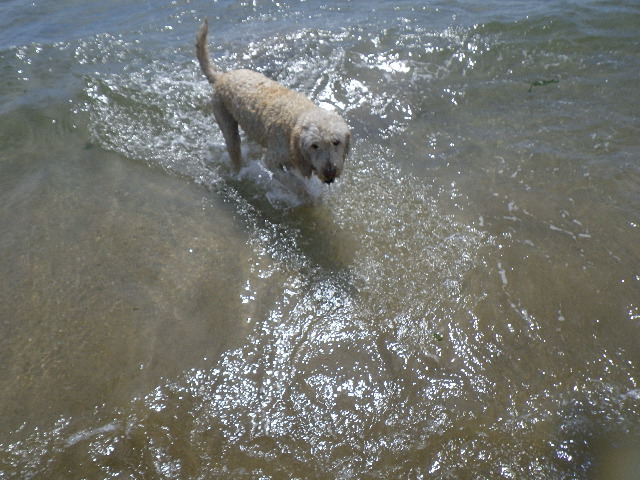 Bearing in mind I pick up Honey’s mess, the sea temperature is still less than ten degrees, it’s term time and mid week, I can’t see any problem at all with Honey being there. 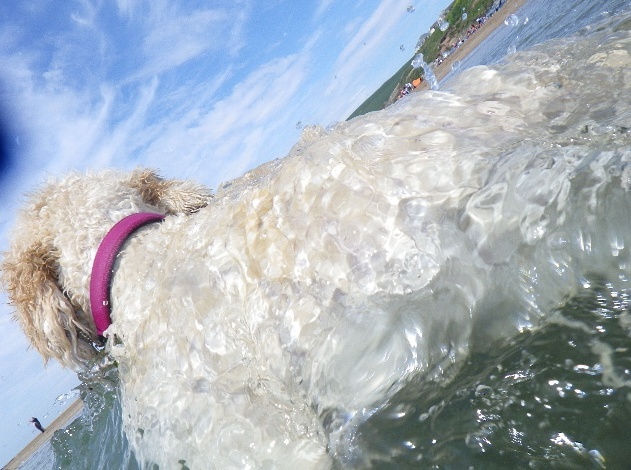 We pay huge water bills because of the cost of cleaning our beaches, and yet we’re not allowed to use many of them with our dogs from May to October. I live in the country, I have dogs. I wouldn’t subject her to a hot day in high summer, but why can’t I go there at this time of year, or in the evenings? End of rant! 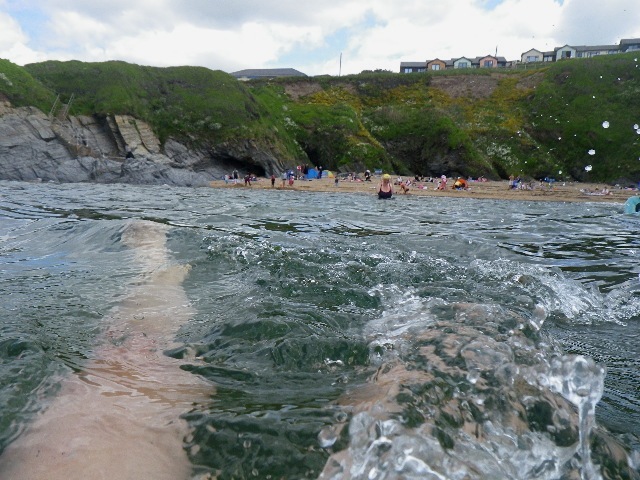 Anyway, we moved on up the coast path to a rocky gully where we sat and chatted and swam in pale turquoise water while Teri filmed with her Go-Pro in Slow-Mo. 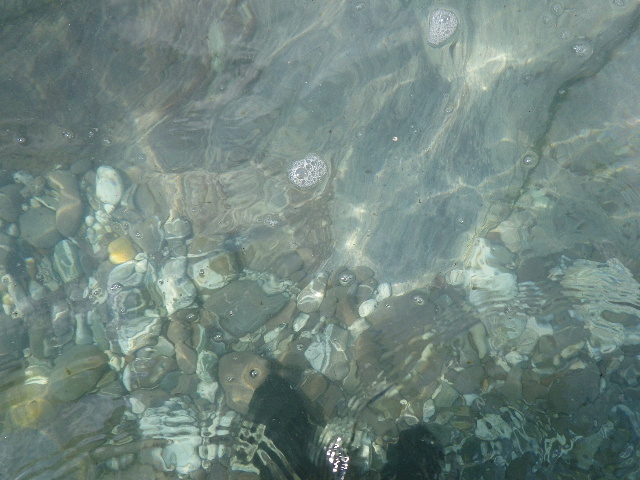 I only managed about ten minutes, but it was so beautiful with the ripples focusing sunlight over smooth, quartz-striped pebbles and rocks. Entranced by the water swirling and lapping around the limpets on the rock where we got in, I was shivering by the time I got out. 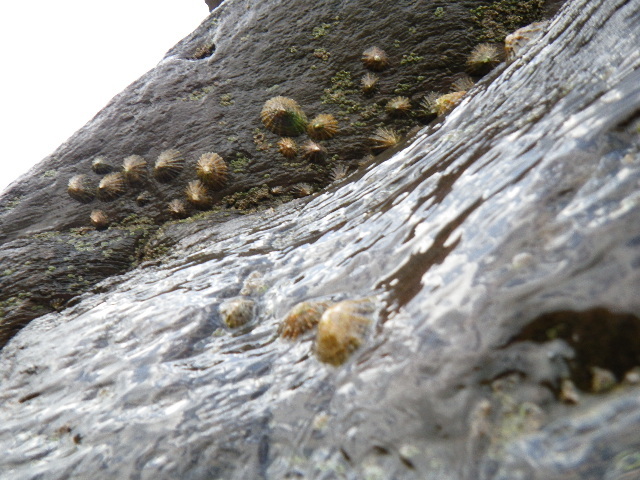 Apparently limpets wander across the rocks in very slow motion and try to lever each other off. They reminded me of little Daleks. It’s Michele de la Mer’s birthday bash at Wembury. 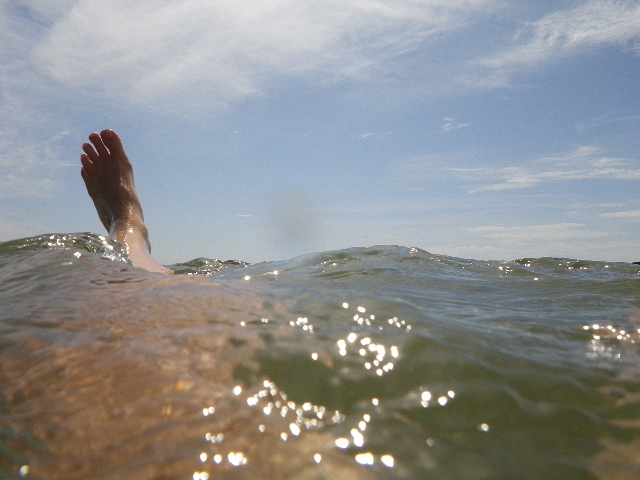 Despite the stormy forecast for 9-14′ surf a large shoal of wild swimmers shows up, including a couple of new fishes. Foaming, frothing sea and silvery-grey skies makes it difficult to distinguish between the two. We leap around and fall down holes, dive under breakers and laugh. 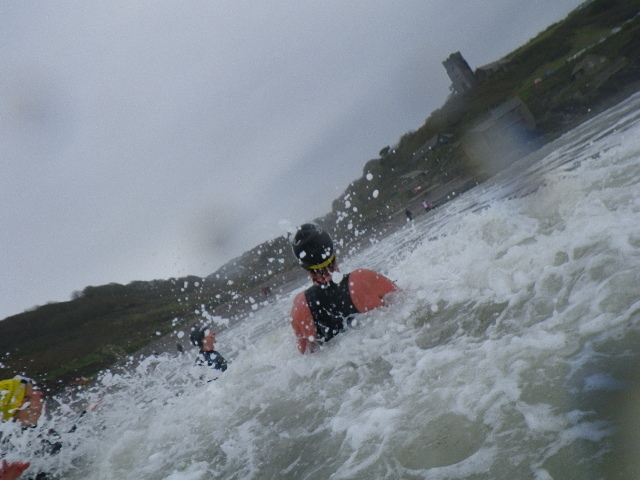 This is the most fun I’ve had in ages; the wildness somehow lightens the relentless cold of the water, and I can almost imagine that a very late spring might be just around the corner. 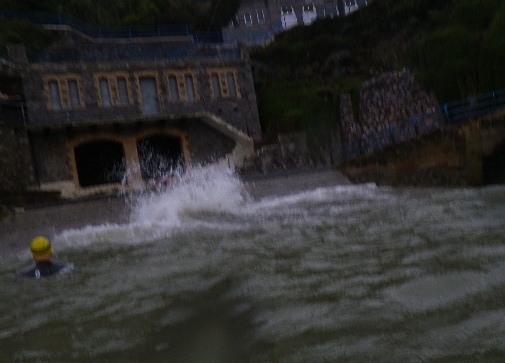 Flooding, gales, biggish wavelets…we decided to have a look at the Hoe before swimming today, and worked out that the incoming tide and the flow from the Plym were pushing water towards the dodgy area from where untreated sewage might flood. The water was brownish, and there were a couple of areas of flotsam and ripped weed but we only saw one log, and that was of the wooden variety. I sniffed carefully, and there was not even a whiff of poo. So Richard, Rosie and I shot in, swam out a little way, bounced around, and swam back in with absolutely no heads under the water just in case. I’d thought I was dreaming when opening the curtains this morning to be confronted with a bright sky and no rain! New Year, New Weather? Honey and I drove in hope to Hope Cove. On the beach we changed to the wonderful retro sound of Esther’s wind-up gramophone music swirling, slowing and quickening with the wind and laughter. At Outer Hope a buffeted Kestrel attempted to hover over the cliff. 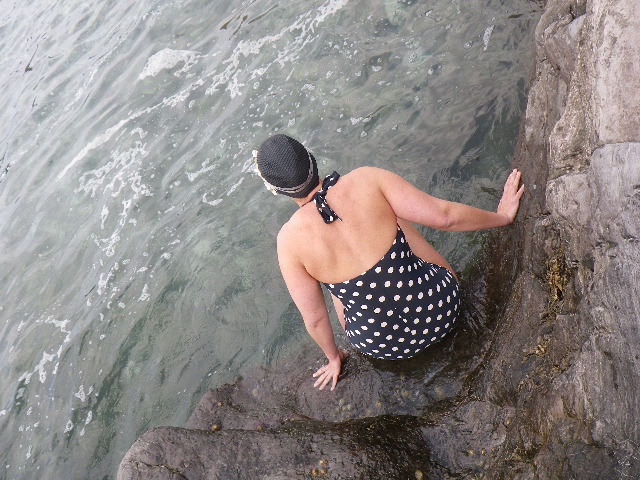 I’d decided against a wetsuit and was delighted to find that the rather frisky water, opaque with mashed weeds like toast crumbs in milky tea, actually felt warm as toast on my wind-whipped flesh. I dived in, and was swaddled. A series of hilariously tortured faces followed us. I struck out and either ducked under the foam or swooped up over the rollers. JJ and Hugo had set off fast, so Sue and I waited for Esther and Claire. 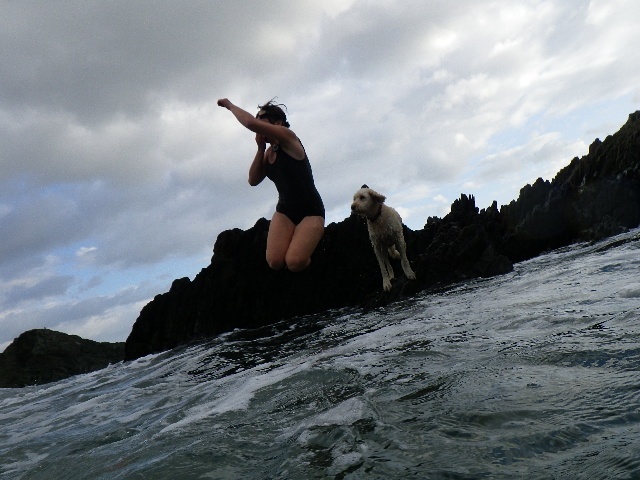 We swam round together and watched as waves disintegrated on pointy rocks. The Pop Art sky set off the lumpy water to form a gallery of stunning seascapes. 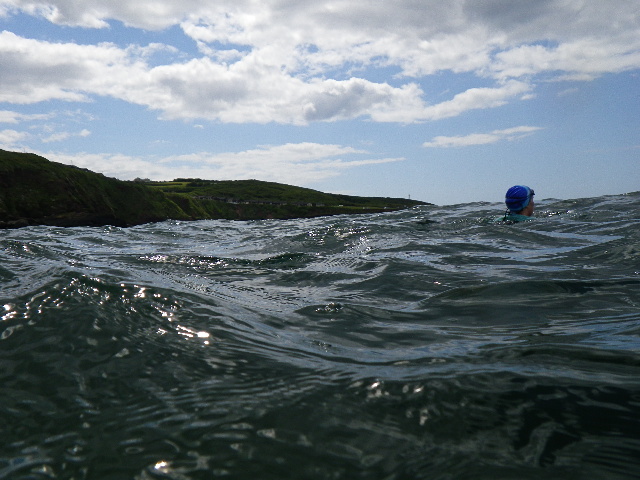 As we approached the beach we began to struggle with the breaking waves, the undertow and the hidden rocks. It was too murky to see what was coming; underwater, dark strips of weed flashed past like space at Warp Speed in negative. I felt warm till I stood wobbling in the shallows, at which point the water ran from my body leaving it exposed to the nasty gale. After a shivering change I could still feel the chill radiate from my body as we wandered to the Hope and Anchor. When you’re this frozen, layers of clothing act like a cool box. 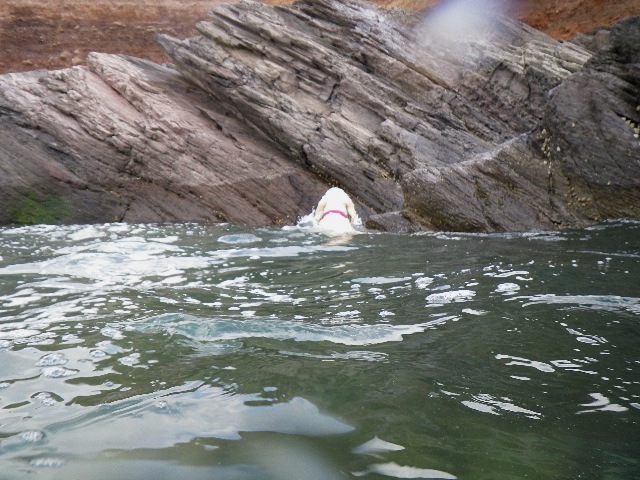 Later, having warmed up beautifully, we walked the coast path to view JJ’s latest plan: Round Burgh Island and on to Thurlestone through the arch in one swim. It doesn’t look far from up there! 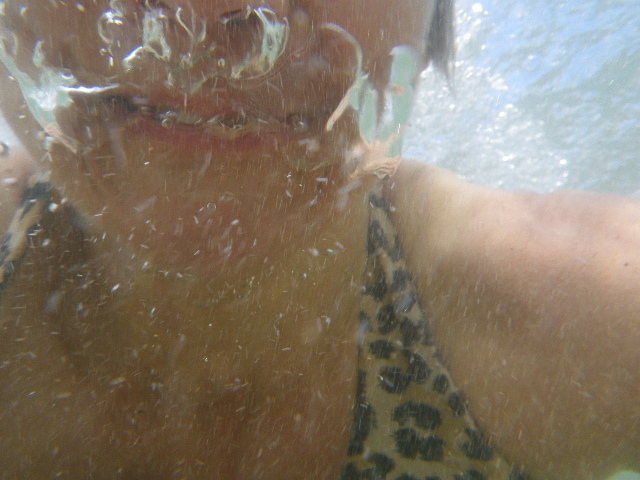 Thank you for reading in 2012, and may your New Year be wet and wild with floods of sunshine. Heaps of tanned pebbles add percussion to our footsteps as we walk to the sea which is gin clear, dead calm and tinted palest turqoise. Babette’s boys are already frolicking like seals. 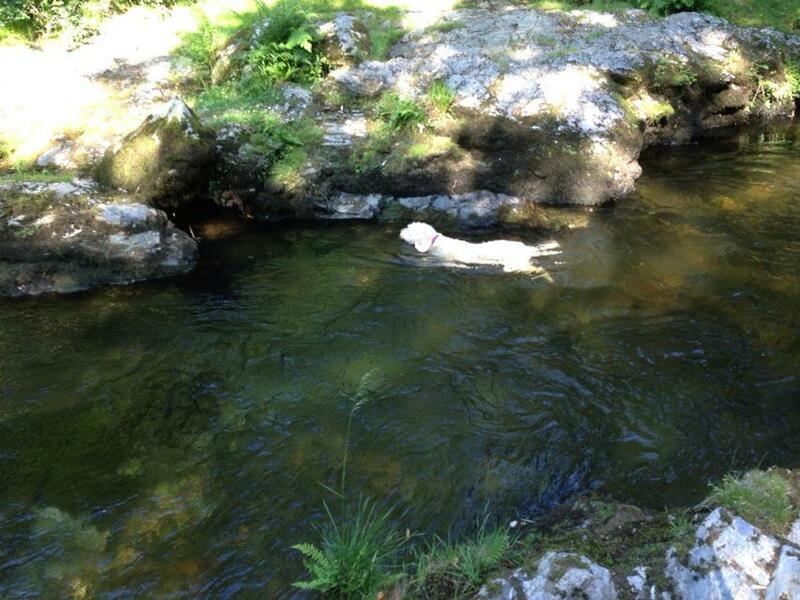 I wade in and feel the nip as the water creeps up my body. 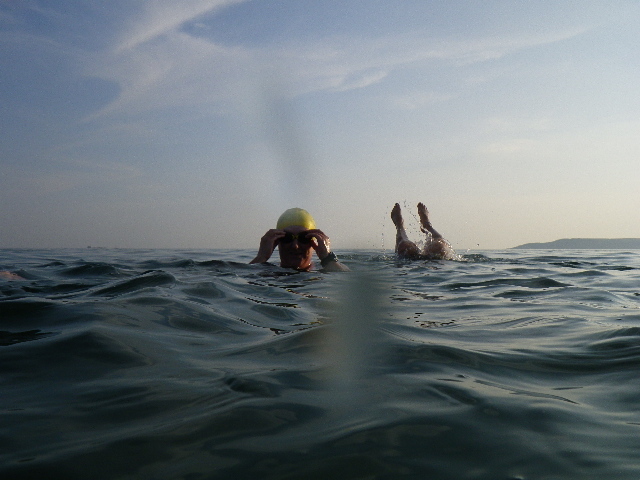 The seabed is steeply shelving and I swim straight away, the back of my neck contracting and shortening my stroke. Beesands is a bleak and haunted place with a widescreen horizon, like the setting for a seaside Spaghetti Western. 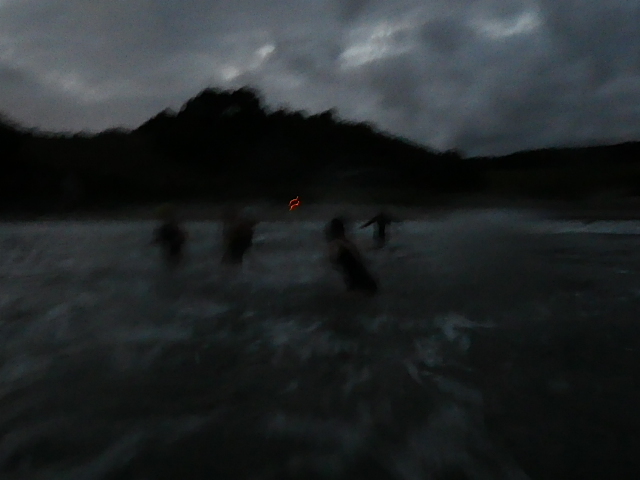 We laugh openly as Babette’s non-outdoor-swimming friends walk in slow motion to their icy nemesis as though to a gun-fight, bodies shrinking and faces contorting with the chill. 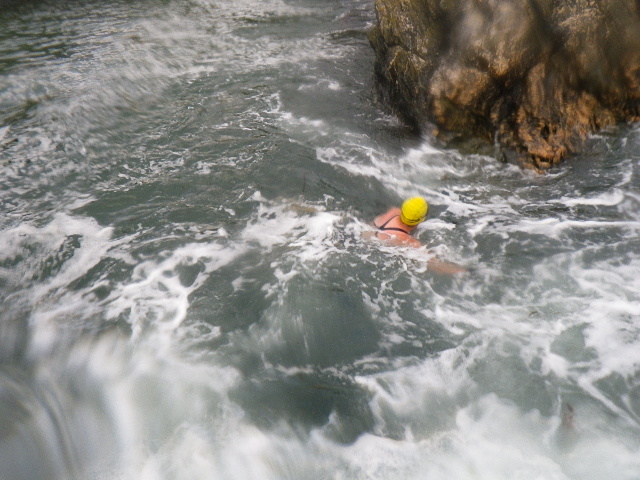 Swimming butterfly, the top of my head is knifed with cold. I surface with a star-burst acid-high.